You may remember my post from a year ago about the rosemary walnuts that I was making for Christmas gifts. This year, in addition to the walnuts, I branched out a little bit and decided to try something a little more labor-intensive, and it ended up being well-worth the effort. 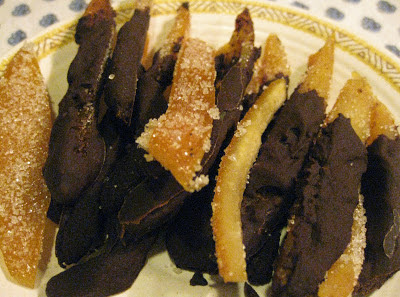 I used all organic ingredients, from the oranges to the sugar to the chocolate, (and I think if you are going to make candied peels, it is better if you can buy organic, especially since non-organic fruit is often coated with beeswax or shellac, in addition to the pesticide residue that is more concentrated on the outer layer of the fruit peel). Most recipes call for cutting your peels in lengthwise pieces away from the orange. I wanted to make my oranges into juice, so I cut them in half, but in the opposite direction than I usually would for juicing oranges so that the pieces would still be the right length and direction. After I squeezed the juice from the orange halves, I cut the peels again into long pieces that were around a 1/2 inch in width, and then worked to remove the pulp and some of the rind from the inside of the peel. Once this was finished, I put the peels in a saucepan and covered them with cold water. At this point, just place the pan with the water and peels on the stove top and heat on high until the water boils. Let it boil for a couple of minutes, and then drain the peels in a colander, return them to the pan, add more cold water, and repeat this process two more times. After this is completed, add 2 and 1/2 cups water to 2 and 1/2 cups sugar in a pan over medium high heat, and stir until the sugar dissolves. Bring this mixture to a boil and then add the orange peels. Reduce heat to low and simmer gently for 90 minutes. After the peels have boiled, use a slotted spoon to remove them from the sugar water and place them on a foil-covered cookie sheet. (People recommend saving the sugar syrup to use later, which I have done, although I am not yet quite sure what to do with it... That will be my next project!) At this point, most recipes call for letting the peels dry for a couple of days. If, (like me), you are pressed for time, you can also put the peels on a foil-lined cookie sheet in the oven and cook them at 200 degrees for an hour or two, turning the peels every 20 minutes. Once they have dried in the oven, roll the peels in sugar to coat. Next, heat the chocolate chips in a small saucepan placed in a larger saucepan that is filled with simmering hot water (or use a double-boiler if you have one) until the chocolate melts, then dip the candied peels one by one into the melted chocolate to coat them. Set them on a parchment paper / wax paper lined tray to cool, and then cool the chocolate covered candied peels on the kitchen counter or in the refrigerator until the chocolate hardens.That's it! Ok, so this recipe calls for a LOT of sugar. And yes, it takes a little more effort to make than the rosemary walnuts, but it is a nice old-fashioned treat, and making it will make your house smell good, and it might even get you in a festive holiday mood. So on that note, Merry Christmas and Happy Holidays!